Runny nose with clear, white, yellow and even green mucus discharge. With a cold, it is easy to wonder whether it is serious or not, will it be contagious? If it is, when is a cold contagious? And what can be done to prevent it from spreading and how to speed up the recovery process are all the concerns with a cold. Rhinovirus is an airborne virus that enters through the mouth or nose. The virus spreads from person to person through close proximity and inhalation or physical touch. Coughing, sneezing or blowing noses are obvious; but talking, physical contact and sharing personal items can also spread the cold virus even if the sick person takes great care to cover their mouth and nose when they sneeze or cough. When the virus enters the body, it begins to multiply and affects the healthy cells. When this happens, the immune system mobilizes and attacks the pathogen, a process that can take up to two weeks. This is a tricky question! The symptoms of a cold mean that the virus is already in the body, and the body is already fighting it - fever and mucus are two ways that the virus is killed and expelled from the body. Researchers believe that an infected person may be contagious as much as 2 or 3 days before the onset of symptoms, making it almost impossible to pinpoint the exact time at which a person becomes contagious. The virus can remain active in the body for up to two weeks. 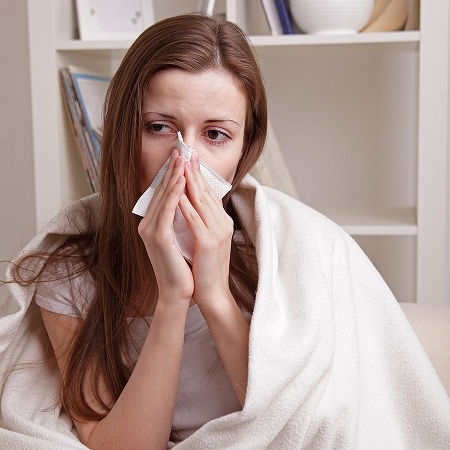 The person is contagious for the entire time; however, the highest risk of infection is during the 2nd through the 4th day of the cold, when symptoms are at their worst. The risk of infection subsides after the first week. Is There Any Cure When a Person Is Contagious? At this time, there is no cure. However, the condition is self-limiting; the virus enters the body, multiplies - essentially going through its ‘reproductive' cycle in the body - and once it has done that (and the body has reacted with a powerful immune response) the cycle is over. Drink plenty of fluids to loosen mucus and help the body expel the virus. Get plenty of rest to allow your body to send as many resources to fighting the infection as possible. Take a few days off from work (your co-workers will appreciate it) - the backlog of work is worth the recovery time. You won't be able to concentrate anyway. Avoid dairy products (which promote mucus), smoking (all-around bad idea), caffeine and alcohol. Take hot chicken soup and tea to soothe sore throats and help boost the immune system. Relieve a sore throat with a warm salt-water gargle (repeat as needed). Improve nasal congestion with saline nasal drops, hydration and hot showers or baths. Over-the-counter medicines help relieve symptoms; however, they do not make the process any faster; as long as you have symptoms, you are still contagious. Vitamins, herbal remedies and homeopathic remedies have their place in the treatment of colds; consult a medical professional for guidance in how and when to use alternative therapies. Avoid the use of antibiotics - they are not effective against the cold virus. How Can Cold Transmission Be Prevented? Wash your hands often, especially after wiping noses, using the bathroom, changing diapers and before preparing and eating food. Use hand sanitizers to kill viruses before your hands come into contact with your mouth or nose. Teach young children to cover their nose and mouth when sneezing or coughing, and to wash their hands often. Keep your distance from sick people. Obviously if you are the parent of a sick child, this is not practical but you can sanitize often, and avoid face-to-face contact. Whenever possible, sleep in a different room than the sick person and use a different bathroom. Give your sick child a cuddle but avoid face-to-face contact to avoid breathing in the virus. Disinfect shared touched surfaces like toys, phones, tubes of toothpaste, TV remotes, computer keyboard/mouse, kitchen counters, door knobs, toilet levers and seats, light switches, refrigerator/microwave handles, sink handles and tabletops. Keep disinfecting wipes handy and visible for an easy reminder to wipe surfaces the sick person has touched. Use paper towels instead of cloth kitchen towels when someone in your home is sick. The sick person should have his/her own towels and bedding; wash these items frequently to kill any lingering viruses caught in the fibers of the fabric. 5. Stock up on essential before cold and flu season strikes! Get plenty of exercise (at least 4 times per week). Ensure good nutrition: avoid stressing your body with processed foods, artificial ingredients and excess sugar (one teaspoon of sugar suppresses your immune response for 10 minutes). Drink plenty of water as every cell and organ in your body requires water for optimal functioning. Get enough sleep (7-8 hours per day). Relieve stress through meditation, exercise and cutting back on nonessential activities that cause stress. If you have babies, breastfeed them for a strong, healthy immune system.